The distinctive new building in Stockholm’s Östermalm is a temporary market hall that was built as a temporary space while the old market hall is being renovated. What nobody expected was the tremendous popularity of this “wooden box”, which ended up winning Sweden’s most prestigious design award. The old market hall, built in 1886, in Stockholm’s Östermalm district is known for the prestige its history carries among its committed customers. In 2012, this well-established rendezvous point in Stockholm’s finest district faced a critical need for a complete renovation, and the city invited bids for the refurbishment project. The entrepreneurs of the market hall needed to relocate for a couple of years. 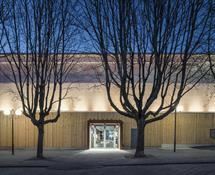 The solution for this challenge was to build a temporary building made of Metsä Wood’s Kerto® LVL (laminated veneer lumber), so that the entire offering of the old market hall was still available under one roof. Afterwards, the building is easy to take down and reuse somewhere else. The architectural agency Tengbom saw the potential in the exceptional circumstances. As part of the refurbishment project, they designed the concept of a temporary, modular wooden building that could built alongside the old hall. Tengbom wanted to promote sustainable construction, and Kerto LVL was the ideal choice for that. “A standard solution for a temporary building would have been a marquee with an aluminium or steel frame. But this solution would have clashed with the prestigious brand of the market hall. And that is what we needed to cherish”, says principal architect Mark Humphreys. The temporary market hall is actually an interesting combination of wood, glass and plastic. All these materials are lightweight, easy to work with and affordable, making them the best choices for temporary use. Even though the architecturally very sophisticated building might look a little rough on close examination, the mission was accomplished, as these affordable materials manage to give an impression of polish and value, just like the neighbourhood around it. The building’s roof structure consists of glulam columns and Kerto LVL beams in a grid structure, which is a strong shape, but makes the construction appear lighter and requires less material. The roof above the grid is made of plywood clad with sound-absorbing insulation made from wood fibre. The acoustics are one of the most successful elements of the project. The plastic used in the building is multichannel plastic with lots of air pockets, giving the material a very good insulation value. The plastic parts are completely prefabricated and they are airtight, watertight and naturally insulated. The glass in the windows is also insulated glass. A fire protection treatment on the wooden parts guarantees the fire safety of the temporary market hall. The beams are painted with a transparent fire-retardant coating on site, and the plywood of the desks and floors has had a similar treatment. The floors and the columns were covered with plasterboard up to a height of three metres. The temporary market hall in Östermalm turned out to be a bright, luminous, modern and truly welcoming place with stores and restaurants. Offering longer opening, hours it has attracted new visitors without losing the regular ones. So far, the market hall has received over 55,000 visitors per week – almost a 100% increase compared to the old hall. The refurbishment of the old market hall will be completed in 2018. The city of Stockholm can look for an opportunity to reuse the building in another location, or they can sell it – the building can have another life. Virpi Koskimies, Communications Specialist, Metsä Wood, tel: +358 (0) 50 4522203, virpi.koskimies@metsagroup.com.